MOORESVILLE, North Carolina -- Twins born joined at the head have gone home to North Carolina, four months after surgery in Philadelphia separated them. The Charlotte Observer reports that Erin and Abby Delaney left the Children's Hospital of Philadelphia on Monday morning after 485 days. 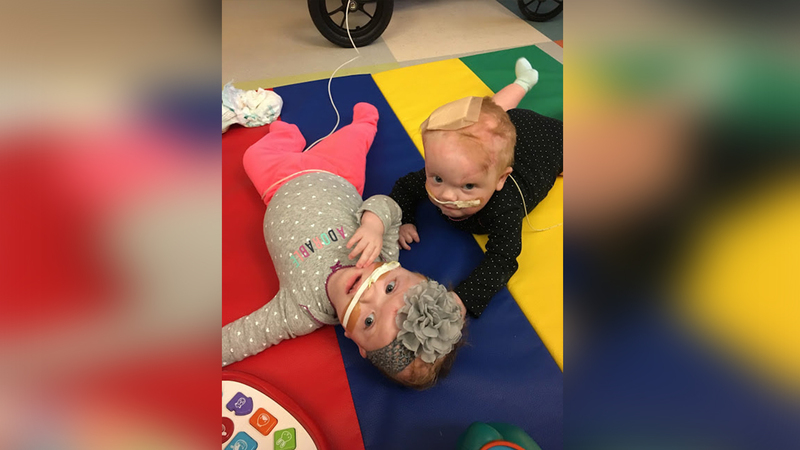 Their parents, Heather and Riley Delaney, of Mooresville, had learned they would be having conjoined twins about 11 weeks into the pregnancy and regularly travelled to the hospital for appointments. The twins were born 10 weeks premature on July 24, 2016, and were separated in an 11-hour surgery performed by a 30-member team June 6. It was the first time the hospital had separated a craniopagus pair, the rarest of conjoined twins. The girls will need more surgeries as they grow, but the hospital says doctors are optimistic.